This case shows how you have to advocate for your patient. You have to be the expert. I talk to a lot of emergency physicians who have trouble convincing their interventionalist colleagues of various ECG findings. Many cardiologists and even interventionalists, are not aware of many of the newer findings of STEMI equivalent, including the Sgarbossa criteria, and especially are unaware of the modified Sgarbossa criteria. My partners and I are fortunate that at our institution there is a long history of ECG expertise in our cardiology department. We also have a very cooperative system in which all concerns of the emergency physicians are addressed. It is very important to establish these relationships so that when difficult cases arise, the patient gets the best care. There is sinus rhythm with LBBB. There is subtle concordant STE in lead aVF, almost 1 mm. There are about 2 mm of discordant STE in III. Since the S-wave is only 3 mm, this is proportionally excessively discordant ST elevation. One may not be convinced of STEMI with less than 1 mm of concordant STE and 2 mm of discordant STE, but it should certainly catch your attention. There is sinus tach and LBBB still. 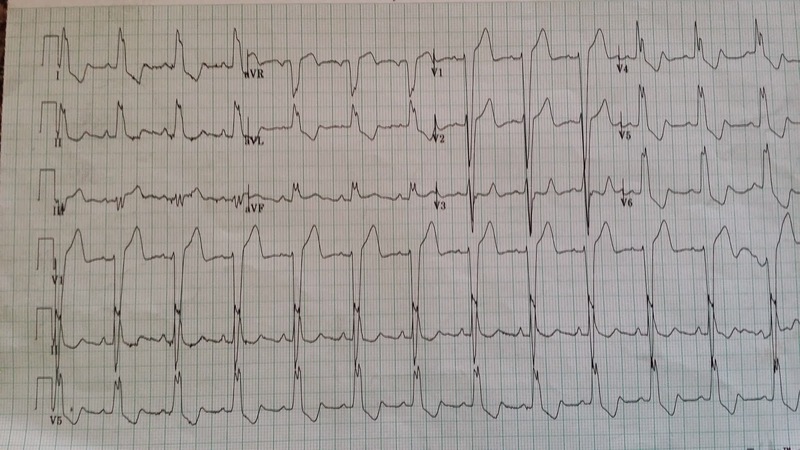 Now there is huge concordant ST elevation in III, also in aVF, and huge reciprocal concordant ST depression in aVL. There is concordant STE in V3 and excessively proportionally discordant ST depression (greater than 30% ratio) in V5 and V6. This second ECG is diagnostic of STEMI. The physician activated the cath lab in the middle of the night. When the interventionalist heard that the patient had LBBB, he was furious and stated that you cannot diagnose STEMI in the presence of LBBB (even though there was a cardiac arrest). When he arrived and saw the ECG, he insisted that all ECG findings were due to post-resuscitation changes. (Aside: while it is true that cardiac arrest can cause strange ST elevation, one can easily differentiate it from actual coronary occlusion by obtaining serial ECGs. If due to cardiac arrest only, it should quickly start to normalize). He insisted that "You inappropriately called in the cath team. The only STEMI by criteria is 2mm ST elevation in 2 consecutive leads with normal QRS AND it is the cardiac arrest that created these ECG abnormalities." The emergency physician insisted that it was STEMI and instructed on the Sgarbossa criteria. He did take the patient to the cath lab and found a 100% acute RCA occlusion. He still insisted that there are no ECG findings in of STEMI in patients with LBBB except for New LBBB. She gave him some papers to read. We now know that new LBBB has very weak correlation with acute occlusion, and that + Sgarbossa criteria is very specific for occlusion, and that the modified Sgarbossa criteria are much more sensitive. The emergency physician's confidence in her diagnosis could have been undermined by the interventionalist. She could have doubted herself and relented. But she had learned about LBBB and Sgarbossa criteria well enough to be confident. She also was aware that consultants are fallible, and have various occasional weaknesses. So she was able to be persistent in advocating for the patient, and to do so diplomatically, so that the interventionalist would not resist. Imagine how resistant the interventionalist would have been if the patient had no cardiac arrest, but rather chest pain only. Thank you, Graham. I will place it prominently. In the context of some ST elevation that shouldn't be there in leads III,aVF in ECG #1 - the straight ST segment and pointed T wave in transition lead V3 is not normal for simple LBBB ... nor is the overly prominent biphasic (with end-positive) T wave in V4. It is interesting in ECG #2 how these 2 leads now manifest coved and obvious acute event ST elevation in V3 - with equally dramatic abnormal ST depression now in lead V4. 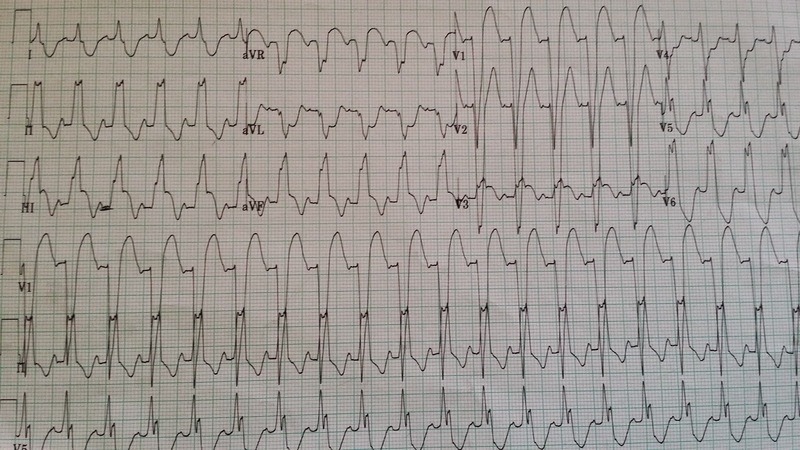 What we saw in lead V3 in ECG #1 was obvious harbinger of what was to follow ... ( = a lesson in itself). Smith modified Sgarbossa rules provide a structure for not overlooking these findings. But the combination of: i) Listening to the patient (who is not "old" and presents with new LBBB and new chest pain); and ii) Recognizing ST elevation that clearly "should not be there" with LBBB (in leads III,aVF) should be appreciated. CREDIT to that emergency physician who as you describe had not only excellent clinical skills but superior personal skills plus the most wonderful quality of advocating for her patient. THANK YOU Steve for posting this great case which illustrates many lessons to be learned. Thank YOU, Ken, for your always insightful comments! My understanding is that Sgarbossa criteria works for ventricular paced rhythms too. Is that correct? We assume that it does, and act as if it does, and it probably does, but the data is scant. Please someone tell me whats concordant and discordant mean? People don't know what they don't know, no matter how long they claim to have done their jobs. Few things I still haven't fully understood and maybe you could help me out. In a setting of excessive discordant ST-elevation (ST/S ratio >0.20) in precordial leads, does it mean septal/anterior ischemia or is it some weird reciprocal change from ischemia elsewhere (inferior/posterior)? Like in this post-ROSC ECG, V1 seems to have an excessive discordance (I counted ST/S ratio of 0.23) but the culprit artery revealed was RCA. Also it confuses me, that this being RCA occlusion, there is concordant ST-elevation in V3 which is anterior lead. Is this concordant STE in V3 actually ST-depression mirror-imaged? Is it possible to accurately predict the culprit artery if LBBB is present? I work and study to become a paramedic in Finland and here the guidelines for emergency reperfusion therapy in a setting of LBBB includes only new LBBB (at least so far). Thank you for excellent free education, I've learned a lot. I'll let my coursemates and colleagues know about your blog as well. Yes, the ST elevation does localize the site of the infarct. you are very perceptive. I had not noticed this ST elevation in V3 (embarrassing!). Here is my explanation: V2 and V3 may be reversed. The maximal ST elvation, then, is in V1 and V2. This is typical for right ventrcular infarction which may commonly occur if the RCA is occluded proximal to the RV branch. Thank you, it makes at least more sense now. Important lesson for confirming lead placement. One thing I'm also thinking of besides your explanation - QRS morphology in V3 takes a drastic change compared to leads around it. At first I thought it has an S-wave, but closer inspection shows it's actually overprint from V2 and QRS is actually entirely positive while all neighbouring leads are negative. Also, V3 in initial ECG is overall negative - in post-ROSC strip it is suddenly overall positive while neighbouring leads maintain their morphology. This makes me think that it is actually V4R instead of V2 or V3, as leads II, III and AvF are also overall positive (so V4R would in my mind fit close to them in frontal axis plane). This would fit in the picture, this being RCA occlusion and right ventricular infarction. One more thing - if I ever run across an interesting case that you might want also to take a look at, what is your minimum requirement of information related to the case? Situation, Background, Assesment (vitals), my own interpretation and if possible, patient outcome? You are absolutely right. V3 is very confusing. If must be a misplaced lead, but I'm not sure where it was placed. It look mostly like lead III, or negative aVL. I wonder if it was placed at V4R or nearby. Yes, if you have a great case, send all the info: history, vitals, echo, all trops, cath results. Thanks for writing this good post. I hope you will write more.